The Old Dungeon Ghyll Hotel Bed & BreakfastThe Old Dungeon Ghyll Hotel is to be found in the magnificent setting of the Great Langdale Valley. It is the 'original' Dale Head Inn and right in the centre of the Lake District. Full use of timeshare cards, Langdale timeshare, swimming pool, sauna, steam room, jacuzzi and gym. Children welcome from any age. 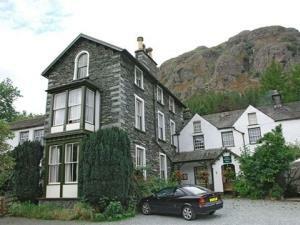 The Old Dungeon Ghyll Hotel sometimes limits bookings to 3 or more days. Double bed with wash basin, wardrobe, chair, desk, tea and coffee facilities, dressing gown provided, hand towel and hair dryer. Double sometimes limits bookings to 3 or more days. Desk, double bed, chair, tea and coffee, hairdryer and wardrobe. double ensuite sometimes limits bookings to 3 or more days. Desk, chair, tea and coffee, hair dryer and wardrobe. Ensuite db/sing sometimes limits bookings to 3 or more days. From Ambleside, Cumbria follow signs for Coniston to the A593 before entering Clappersgate. Continue through Clappersgate before branching onto the B5343 following signs for Langdale and passing through Elterwater and Chapel Stile. Continue for a further 3 miles before turning right towards the Old Dungeon Ghyll Hotel. Perfect for low maintenance hikers. Good bed and bathroom facilities but no frills. No TV and Poor WiFi could be improved but this is the downside for being in the single most amazing part of the Lake District. Service was friendly but slow to respond or not present. Nice breakfast, flexible to the guests requests.